What I like most about the work is the anticipation. What new bird, bug, spider, lizard, or flower will I see during the day? And sometimes they are even new to science. I love the mystery and the subtlety of so much of the forest. There are birdcalls I have heard for years and never yet identified. In the southern Lomami Park. I have had a real privilege to experience and live in the still vast natural landscapes of Congo. To see giant tiger fish surface on the Lomami River, migrant swifts in the thousands turning on uplifts hundreds of meters above me. I love seeing nature everywhere. The sunbirds in our garden in Kinshasa. Sometimes it is the humor and incongruity of it all that stays with me. The open billed storks crossing the city of Kinshasa every evening to roost in their hundreds in a tree in the courtyard of the military prison where they have been spending the night safely for years with some of the most notorious criminals in the country. Two years ago, I watched warily for half an hour as a huge thunderstorm built around me. I was crossing the open savannas in the south of the park. I was calculating all the time – would I make it across before the sky opened with a torrent of rain. Then a flash and nearly instantaneous crack and the piercing odor of ozone dropped me to the ground. Within minutes, lightning flashes were all around. Some hit the ground on both sides, and less than a km away. Three or four times I was so terrified I lay down in narrow stream crevices in the soil, praying I would not be struck. Then I got enough courage to stand up and move on ahead until the next series of flashes and cracks. I was so happy to reach the cover of the trees. Not a drop of rain fell. I hope over the next three to five years to be able to inspire and guide the next generation of explorer naturalists, of all nationalities, to find their own inspirations and motivations in nature. I hope we can play our part in ensuring that Congo’s still magnificent natural heritage passes on after us to generations to follow. Not having my binoculars at hand when I need them. 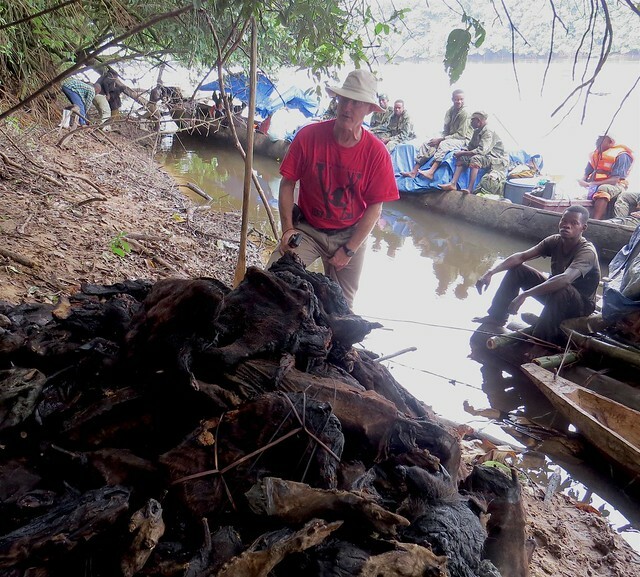 In 2009 I saw the dead and savaged carcass of a mother bonobo displayed for sale in a village, with its ophan now yet dead being taunted by children. The hunter sat beside casually bartering its sale. 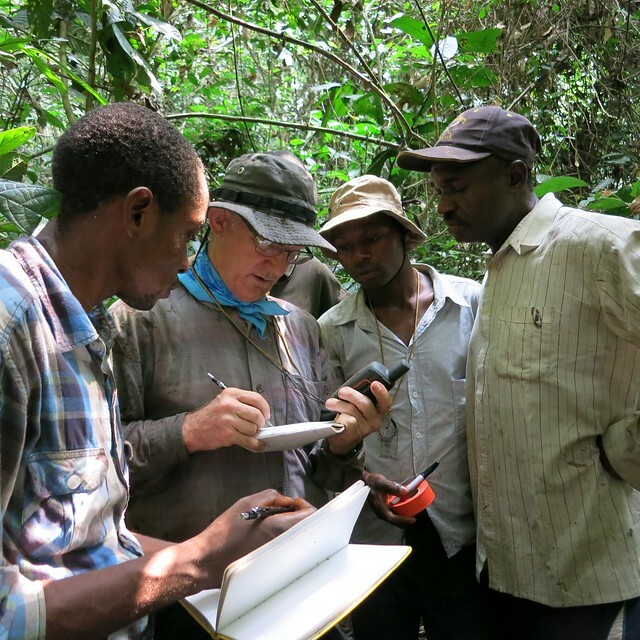 John was born in 1950, and first came to DR Congo on a Watson Fellowship to study the ecology of the pygmy livelihood in 1973 – 1976. 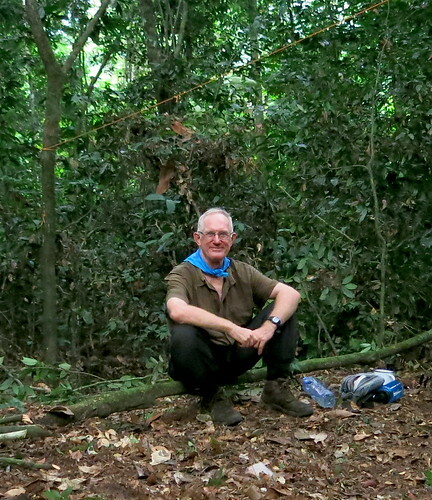 He studied the ecology of duikers, principal bushmeat species for his PhD in 1980-83. He worked for WCS in 1985-2007 before joining the TL2 project full time. His main responsibilities are Coordinating animal monitoring and patrols throughout the park and in the bufferzone. He trains and mentors staff and students and produces maps both to guide field work and illustrate results. He and Terese are grand parents. And John is the eldest of 8 children…many of whom are themselves grandparents. As a friend, Laura Snooks, once defined conservation to me. Our victories are ephemeral. Tomorrow we will have to wake up and defend them again… Yet our losses loom definitive. Yet hope does spring eternal, and with it restoration of life and sprit.